Surgical removal of brain tumors may become easier and more precise, thanks to Binghamton University research that recently received funding from the National Institutes of Health. Fake “Frank” Lu, an assistant professor of biomedical engineering, uses stimulated Raman scattering (SRS), a molecule identification technique, to develop a multicolor imaging technology for brain cancer pathology during surgery. A three-year, $750,000 R00 grant from the National Institute of Biomedical Imaging and Bioengineering (NIBIB) supports his research at Binghamton. There are two steps to get rid of a brain tumor: removing the literal mass and then removing the lingering cancer cells at the edges. Removing the lingering cells can be tough, requiring evaluation to avoid destroying functioning brain structures. With intraoperative staining-based histopathology, tissue samples are taken and evaluated in a nearby laboratory. Although accurate, this is ultimately a slow process, only allowing three samples to be evaluated during surgery. Fluorescence imaging uses fluorescent dyes to label and locate the cancer cells. Unfortunately, this is a messy process and isn’t accurate at distinguishing the margins of the tumor. Lu’s technology is label-free, rapid and detailed. He expects that in the future, SRS can be used to evaluate 20-30 tissue samples during surgery to help delineate the tumor margin. SRS detects “molecular fingerprints” by exciting the chemical bonds in molecules and reading the frequencies emitted by the vibrational states of the bond. This information is then used to assign different colors to the molecules, allowing for a detailed image. Lu has also improved SRS so that it can create images of lipids, fatty acids that he says are important markers for the presence of cancer cells. Axons, the long, thread-like sections of nerve cells, are wrapped in lipid layers called myelin sheath. In areas affected by cancer, they break down, leaving lipid droplets that can be easily detected by Lu’s technology. Lu envisions the technology being incorporated into a machine for operating rooms, and he is debating two options: a handheld probe to create images of the internal cavity, or a device that creates images of tissue samples from multiple locations. “We are providing a tool that is complementary to the current neuronavigation system,” he says. The next step is to collect more data to solidify the efficiency of the technology. Lu is collaborating with SUNY Upstate Medical University and Brigham and Women’s Hospital to get larger data sets. Eventually, Lu would like to implement machine learning into the technology for faster and more efficient diagnosis. He also hopes to apply this technology to other types of cancer diagnosis and even other neurological diseases, including Alzheimer’s, and do more work in live cell imaging. 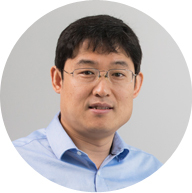 Before joining Binghamton’s faculty in 2017, Lu completed a post-doctoral fellowship at Brigham and Women’s Hospital and Harvard Medical School, where he collaborated with cancer pathologists, surgeons and researchers to transform this technology. He also secured a prestigious NIH K99 Pathway to Independence Award, which is designed to facilitate researchers’ transitions from post-doctoral work to independent tenure-track jobs. Lu, who was born in Shandong, China, received an undergraduate degree in optoelectronics from Zhejiang University in China and a graduate degree in bioengineering from the National University of Singapore. As a kid, Lu was always tinkering, even attempting to develop a FM radio and an electric generator. Ever since, he has been on course to create innovations that would benefit society.